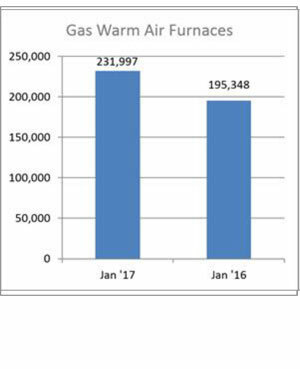 U.S. shipments of residential gas storage water heaters for January 2017 increased 1.8 percent to 360,133 units, up from 353,708 units shipped in January 2016. 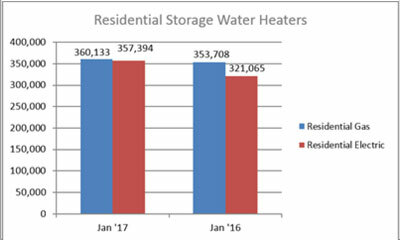 Residential electric storage water heater shipments increased 11.3 percent in January 2017 to 357,394 units, up from 321,065 units shipped in January 2016. Commercial gas storage water heater shipments decreased 4.1 percent in January 2017 to 6,832 units, down from 7,125 units shipped in January 2016. 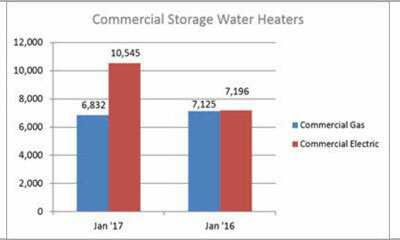 Commercial electric storage water heater shipments increased 46.5 percent in January 2017 to 10,545 units, up from 7,196 units shipped in January 2016. 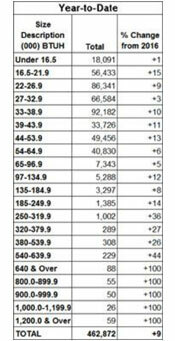 U.S. shipments of gas warm air furnaces for January 2017 increased 18.8 percent to 231,997 units, up from 195,348 units shipped in January 2016. 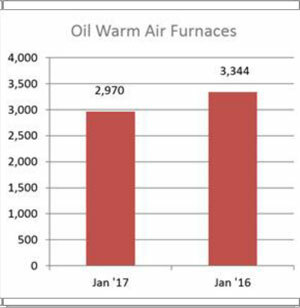 Oil warm air furnace shipments decreased 11.2 percent to 2,970 units in January 2017, down from 3,344 units shipped in January 2016. 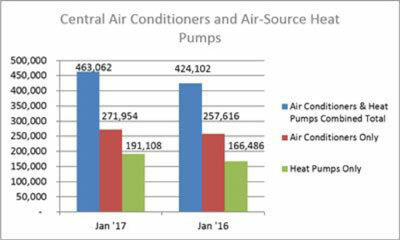 U.S. shipments of central air conditioners and air-source heat pumps totaled 463,062 units in January 2017, up 9.2 percent from 424,102 units shipped in January 2016. U.S. shipments of air conditioners increased 5.6 percent to 271,954 units, up from 257,616 units shipped in January 2016. U.S. shipments of air-source heat pumps increased 14.8 percent to 191,108 units, up from 166,486 units shipped in January 2016.